The articles published in Journal of Agricultural Science and Food Research have been cited 293 times by eminent researchers all around the world. 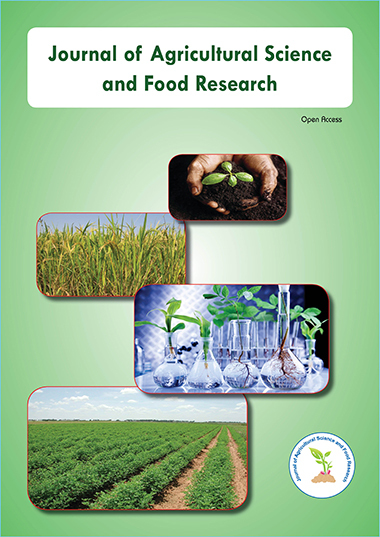 Following is the list of articles that have cited the articles published in Journal of Agricultural Science and Food Research. Badar R, Qureshi SA (2014) Comparative Effects of Biofertilizers, Chemical Fertilizer and Fungicide on Growth of Brassica nigra. International Journal, 2: 266-278. Mishra G, Dutta A, Pandey S, Giri K (2016) Nanotechnology Applications for Sustainable Crop Production. Applying Nanotechnology for Environmental Sustainability, 164. Sarnaik DD (2014). STUDIES ON INTEGRATED NUTRIENT MANAGEMENT IN POTATO (Solanum tuberosum L.)” (Doctoral dissertation, Indira Gandhi Krishi Vishwavidyalaya, Raipur). Madhusudhan L (2016) Organic Farming-Ecofriendly Agriculture. J Ecosys Ecograph, 6: 2. REVATHI K (2011) IMPACT OF BIOFERTILIZERS ON NUTRIENT CONTENT AND ANTIOXIDANT ACTIVITY OF SPINACH BEET (Beta vulgaris) (Doctoral dissertation, ACHARYA NG RANGA AGRICULTURAL UNIVERSITY). Muter O, Pogulis A, Grube M, Gavare M, Berzins A, et al. (2014). Potato pulp as a composting substrate. Å½emdirbystÄ (Agriculture), 101: 57-66. Vanithamani J, Koperuncholan M, Kamaraj M (2017) A statistical approach of Biochemical Screening with various Biofertilizers and inorganic NPK influence on Amaranthus polygonoids (L.). Amrutha JV (2016) Nano Science in Horticulture. Nano Sci Nano Technol, 10: 107. Badar R, Qureshi SA (2012) Use of Trichoderma Hamatum alone and in combination with rhizobial isolates as biofertilzer for improving the growth and strength of sunflower. Journal of Basic and Applied Scientific Research, 2: 6307-6314. Arun Kumar R, Sathish Kumar D, Nishanth T (2011) A Confront on Cancer allied Diabetic Patients. J Carcinogene Mutagene, 2: 22-24. Siddiqui A, Jeevani T, Naga Anusha P, Hima Bindu A (2011) Stem cell therapy for liver diseases. J Stem Cell Res Ther 1: 2. El-Shenawy NS, AL-Harbi MS, Hamza RZ (2015) Effect of vitamin E and selenium separately and in combination on biochemical, immunological and histological changes induced by sodium azide in male mice. Experimental and Toxicologic Pathology 67: 65-76. Sandhu MA, Saeed AA, Khilji MS, Ahmed A, Latif MS, et al. (2013) Genotoxicity evaluation of chlorpyrifos: a gender related approach in regular toxicity testing. The Journal of toxicological sciences, 38: 237-244. Srilatha B (2011) Nanotechnology in agriculture. J. Nanomed. Nanotechnol 2: 5. Bream AS, Amer MS, Haggag AA, Mahmoud MA (2017) Valuation of water pollution using enzymatic biomarkers in aquatic insects as bioindicators from El-Mansouriya stream, Dakahlia, Egypt. Int J Adv Res Biol Sci 4: 1-15. Isman MB, Seffrin R (2014) Natural Insecticides. Advances in Plant Biopesticides 21. Aktar MJ, Islam MS Research Article An eco-friendly approach to reduce reproductive attributes in the housefly, Musca domestica L. using crude plant extracts. Ranaa H, Khana MF, Eijazd S, Akbarb MF, Achakzaic JK, et al. QUANTITATIVE ANALYSIS OF TOTAL PROTEIN CONTENTS IN LARVAE AND ADULT HOUSEFLIES (MUSCA DOMESTICA) UNDER THE TOXIC EFFECTS OF AZADIRACHTA INDICA EXTRACTS.